Since 05/16/16 the new universal app for Windows 10 (Desktop and mobile) Version 17.10.1 is available at the Microsoft store. There were many wishes at Uservoice. I have tested it a few days. We may discuss the possibilities of this App. But there are are good reasons, to install this app. I’m happy to have the possibility, to have a quick view to several OneDrive and OneDrive for Business accounts. I do not have to switch to a browser, logoff and Logon to the different accounts. And this app is quick. 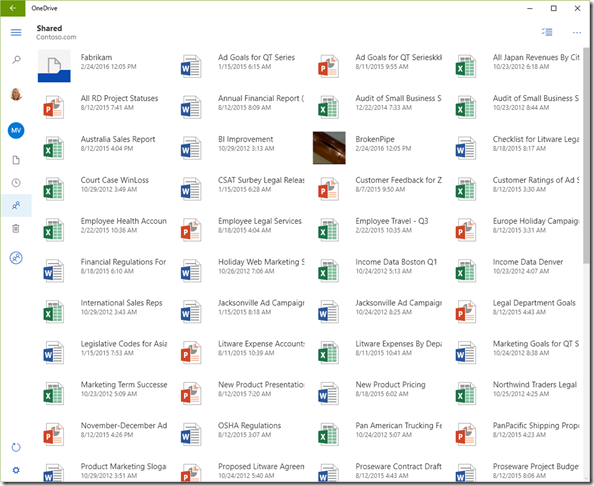 The picture shows two OneDrive personal Accounts and one OneDrive for Business account. The Account credentials are stored in the app. But You will be asked, If you want to do this. Copying and moving data in one account is fast. Coping Data between the different accounts is only possible via Share and Send to. So the data will be downloaded and then a second instance of the app opens and you may upload the data to another account. I found an error doing this, copying data from one OneDrive (Personal) account to another OneDrive Personal Account. The data is copied, but will not shown on the second account. Doing the same action and have a OneDrive for Business Account as destination, it works with success. The app is quick and if you save the credentials you may switch very quick between the accounts and the data. You never will be asked again for your credentials. You may share your data and you may edit the data, but not in the app. The document or picture will be downloaded and then the linked App opens the data. This app is for users, which do not have enough space for a local synchronization. It is fully functional for tablet devices. You do not need a Web Browser, but you need an internet connection. If you have more than one OneDrive (Personal) this app is ideal. With the The Next Generation Sync Client you are allowed only one OneDrive (Personal) account. But these users are rare.